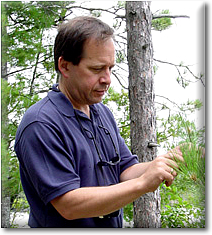 I have been a member of the Department of Ecology & Evolutionary Biology since 1986. My research focuses on the evolution and genetics of plants. I've studied the evolution of plant mating systems; explored how basic principles of ecology, evolutionary biology, and systematics should influence conservation decisiions; and developed statistical methods for analyzing genetic diversity in spatially structured populations. Since January, 2012 I have been serving as Vice Provost for Graduate Education and Dean of The Graduate School. Click on one of the tabs to the right for more information about my research. If you're interested in a more detailed summary of my career, download a copy of my CV or click on the links to my Google Scholar page, my papers in UConn's repository (DigitalCommons), or my profile on FigShare, Mendeley, or ORCID.